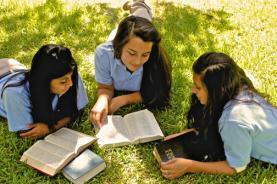 Evangelhouse Christian Academy is a Christian boarding school based upon biblical principles. An authentic relationship with Jesus Christ is nurtured and developed within the school's setting, and through local church involvement. An overriding emphasis on conservative Christian values permeates all segments of the program. The Christian emphasis seamlessly integrates with professional counseling and clinical aspects of the school. Although it is never forced, our lively spiritual atmosphere, discipleship curriculum, interactive worship, and church involvement encourage students to explore the benefits of a life-changing relationship with God through Jesus Christ. Christian families who enroll their daughter at Evangelhouse can rest assured she will be surrounded by a spiritually safe environment with conservative Christian values. Students are protected from the influence of unhealthy media, secular music, internet distractions, and destructive elements of today's pop culture. Students at Evangelhouse are supported in Christian beliefs with qualified ministry-minded instructors. 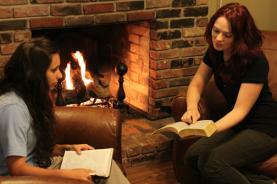 All staff at Evangelhouse hold relevant professional degrees and student ministry experience. The staff at Evangelhouse not only teach a Christian lifestyle, they live it. Evangelhouse students are instructed in practical applied life skills through biblical teachings. Students participate in weekly small group discipleship meetings that include a culmination of readings, biblical passages, and psychological principles. For the first stages, students work on character development. As spiritual growth becomes evident in their lives, students are trained in peer leadership. While the school maintains a non-denominational approach, Evangelhouse has a special relationship with First Assembly of God Church in Lafayette, Louisiana. 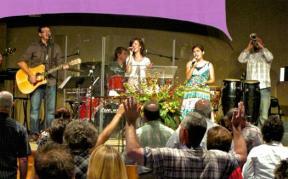 Students attend Sunday morning worship and mid-week youth group meetings. Staff supervise their involvement, but students are welcomed by the people of the church. Since 1995, First Assembly and Evangelhouse have worked together to provide teens the opportunity for an authentic experience with God. The church provides a chance for students to explore and experience God in a renewed way, yet these teens are taught to honor their parents' denominational background within that renewed relationship. Families from a variety of Catholic and Protestant Church backgrounds find this approach effective for reconnecting their daughter to God through Jesus Christ. Students are encouraged to take notes of church sermons, develop personal bible study habits, and create a personal prayer time. Each school day begins with a group prayer and devotional thought for the day led by students. Each night before bed, the group is given time for personal reflection before participating in a peer-led prayer group. Weekly group meetings are held to share struggles and provide encouragement within the peer group. Staff members also supervise and guide each individual to develop healthy spiritual disciplines. The Evangelhouse experiential education and family therapy approach has helped many teenage girls find their way in the world and live a life of faith. Our Christian life-coaching program gives teenage girls the confidence they need to overcome obstacles and thrive. We encourage students to apply biblical teachings to real-life situations and to rely on these teachings to help guide them through their teenage years and beyond. If you have more questions about our adolescent spiritual development program, please call us at 1-800-924-4012 or visit our contact page.